There is nothing novel about BBC misrepresentation of Israel’s naval blockade on the Gaza Strip and the restrictions placed on the entry of dual-use goods to that territory. However, that topic now moves into the limelight once again because one of the demands put forward by Hamas – and, significantly, now backed by the PA – is the lifting of the blockade as a pre-condition for a ceasefire to bring an end to the current hostilities. That Hamas demand, among others, has been voiced numerous times over the past couple of weeks, but notably recent days have seen it being amplified – and justified – in BBC coverage along with the concurrent and similar Hamas demand regarding the border with Egypt. On July 22nd Lyse Doucet was to be found in Rafah. 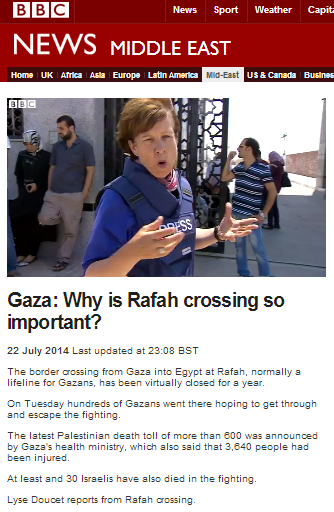 The filmed report she produced – aired on BBC Television news and promoted on the BBC News website under the title “Gaza: Why is Rafah crossing so important?” – opens with an airbrushed explanation as to why that crossing has been closed for much of the last year or so, in much the same way as her colleague Yolande Knell reported on the same topic last August. Notably, Doucet makes no mention of the Gaza Strip-based Salafist groups which have committed acts of terrorism in Egypt’s northern Sinai area and no effort is made to present the Egyptian viewpoint. Later Doucet turns her attentions elsewhere. Doucet of course refrains from informing viewers that on at least two occasions since the beginning of Operation Protective Edge, terrorists in Gaza have cut off the electricity by damaging power lines with missiles fired at Israel and that – despite ongoing attacks – technicians from the Israel Electric Corporation went out to repair those high voltage lines. 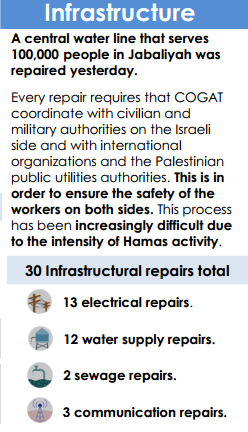 Other repair operations to infrastructure in the Gaza Strip carried out by Israel can be followed in COGAT’s daily updates. 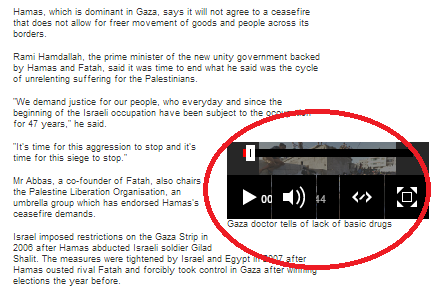 Here we see yet another BBC report erroneously attributing problems in the Gaza Strip exclusively to Israel’s policies when in fact – like the shortages of medicines – the issues with electricity and fuel supply have nothing to do with Israel and everything to do with internal Hamas-Fatah disputes. Not only does Doucet imply to audiences that there is room for doubt regarding the real reasons for Israel’s policy with her use of the phrase “Israel says it’s a security measure”, but she fails to inform them that those policies – in fact implemented three months after Hamas carried out its violent coup in the Gaza Strip – were a direct response to escalating Hamas terror attacks. 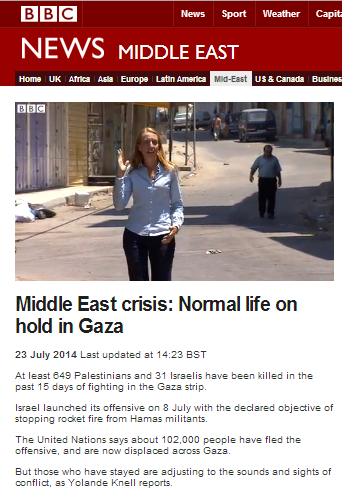 The day after that report, July 23rd, viewers of BBC television news saw another one by Yolande Knell which was promoted on the BBC News website under the title “Middle East crisis: Normal life on hold in Gaza“. That report found Knell once again visiting a market in Gaza. “One positive sign for the truce efforts has been general support for Hamas’ demands from the other Palestinian factions. I’ve been to see Fatah parliamentarian Faisal Abu Shahla. Yet again, no effort whatsoever is made to explain to BBC audiences how the actions of terror organisations from the Gaza Strip caused two neighbouring countries to implement policies to protect their own citizens. “Hamas, which is dominant in Gaza, says it will not agree to a ceasefire that does not allow for freer movement of goods and people across its borders. “We demand justice for our people, who everyday and since the beginning of the Israeli occupation have been subject to the occupation for 47 years,” he said. Mr Abbas, a co-founder of Fatah, also chairs the Palestine Liberation Organisation, an umbrella group which has endorsed Hamas’s ceasefire demands. Israel has of course not occupied the Gaza Strip for nine years, but that point is not clarified to readers. Again, no mention is made of the fact that it was the escalation of Palestinian terrorism following the June 2007 Hamas coup which caused the Israeli government to declare the Gaza Strip a hostile territory in September 2007. This article also includes further promotion of the falsehood that the shortage of medicines in the Gaza Strip is caused by Israeli policies by including the item broadcast on BBC Radio 5 live on the same day. “The leader of Islamist militant group Hamas has said there can be no ceasefire to ease the conflict in Gaza without an end to Israel’s blockade. “In addition to lifting the eight-year economic blockade, Mr Meshaal’s list of demands also included the opening of the Rafah border crossing with Egypt and the release of Palestinian prisoners. Yet again no information is given to readers regarding the terror attacks on Israeli civilians by Hamas and other terrorist organisations which brought about the restrictions. 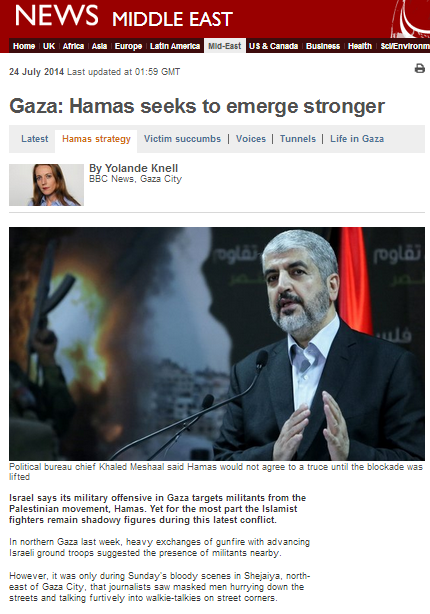 Another article appearing on the BBC News website’s Middle East page on July 24th under the title “Gaza: Hamas seeks to emerge stronger” was written by Yolande Knell. One of many notable features of that report is yet another inadvertent documentation of the fact that Hamas uses civilians in the Gaza Strip as human shields. Another is Knell’s now habitual misrepresentation of Hamas’ international designation as a terrorist organization. “They [Hamas] consistently demand that any ceasefire deal must include a release of prisoners from Israeli jails and an easing of the border restrictions imposed on Gaza by both Israel and Egypt. Gaza Strip-based terrorism against Egypt is also seriously downplayed in Knell’s account and the smuggling of weapons through tunnels under the Rafah border is erased. Since the Islamist President Mohammed Morsi was ousted from office a year ago, Rafah, Gaza’s main gateway to the world, has been kept shut most of the time. The Egyptian military has also closed down the network of hundreds of Hamas-licensed smuggling tunnels that ran under its border. These provided a lifeline to the coastal enclave and provided Hamas with vital funds. So as we see, five separate items of content over three consecutive days have presented BBC audiences with information on the issue of Hamas’ pre-condition for a ceasefire which exclusively portrays the Hamas view of border restrictions. None of those reports has given readers or viewers an accurate account of how, when and why both Egypt and Israel adopted policies concerning their borders with the Gaza Strip. The terrorism which brought about those policies has not even been mentioned and no explanation has been given regarding the vital role played by the naval blockade and border restrictions in curbing the flow of missiles and other weapons to the Gaza Strip. Clearly, BBC audiences cannot reach informed opinions or “participate in the global debate” on this very topical subject without that vital information and context. But the repeated promotion and amplification of inaccurate, politically motivated claims of shortages of medicines and food in the Gaza Strip because of Israeli policies which we have seen across many BBC platforms in the past few days suggests that the BBC has no intention of providing comprehensive, accurate and impartial reporting on this topic and that intends instead to use emotive partial accounts to amplify the same version of the story as is promoted by Hamas. If the Hamas demands I’ve read today are correct, then Hamas is demanding nothing less than the complete disarmament of Israel BEFORE they will negotiate. Resistance? Israel is the resistance. When the Battle of Shifa rids Gaza of Hamas terrorists’ high command, will the corrupt BBC’s Propaganda Yolande be there to document, inadvertently or not, Hamas’s use of patients as human shields or mislead licence fee payers by blaming Israel? Is it a prerequisite for the appointment of BBC ‘journalists’ that they be Jew-hating liars? but its ok to imprision 1,7 million people … Dont forget how was Isreal founded. oh i forgot by TERRORISM from Zions.. No most are not jew Haters most just hate how Isreal always cries wolf but other hand are state terroists and bully everyone into their opnions. They arent even intrested in peace one bit really . who annexed the Golan heights in 1967 etc.. If i was resisting i would be in my country in WW2 a freedom fighter…….